Xinafoate BP and Fluticasone Propionate BP 100mcg inhalation powder. 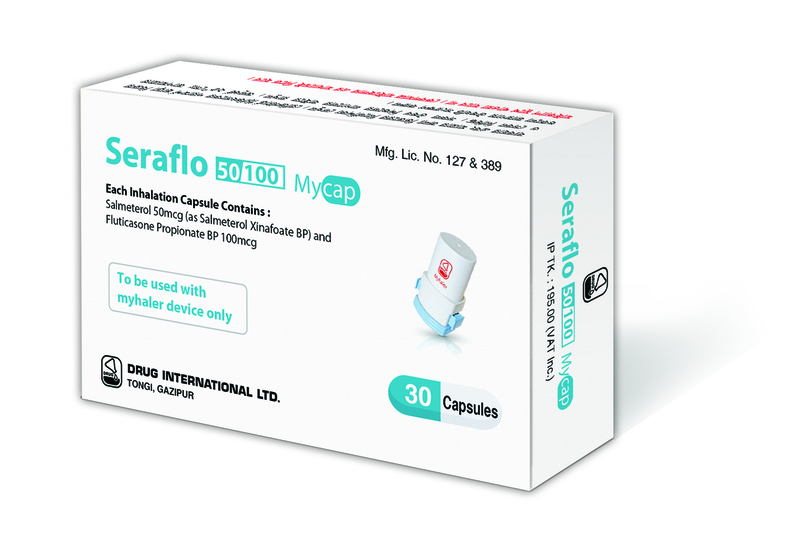 Seraflo 50/250 Mycap : Each Capsule Contains Salmeterol 50mcg as Salmeterol Xinafoate BP and Fluticasone Propionate BP 250mcg inhalation powder. Indications : Treatment of asthma : Fluticasone Propionate & Salmeterol Xinafoate combination is indicated for the treatment of asthma in patients aged 4 years and older. It is indicated for patients not adequately controlled on a long-term asthma control medication, such as an inhaled corticosteroid or whose disease severity clearly warrants initiation of treatment with both an inhaled corticosteroid and LABA. Once asthma control is achieved and maintained, assess the patient at regular intervals and step down therapy if possible without loss of asthma control and maintain the patient on a long-term asthma control medication, such as an inhaled corticosteroid. It is not indicated for the relief of acute bronchospasm. Maintenance treatment of COPD: Fluticasone Propionate & Salmeterol Xinafoate combination is indicated for the maintenance treatment of airflow obstruction and to reduce exacerbations in patients with chronic obstructive pulmonary disease, including chronic bronchitis or emphysema. hours apart). 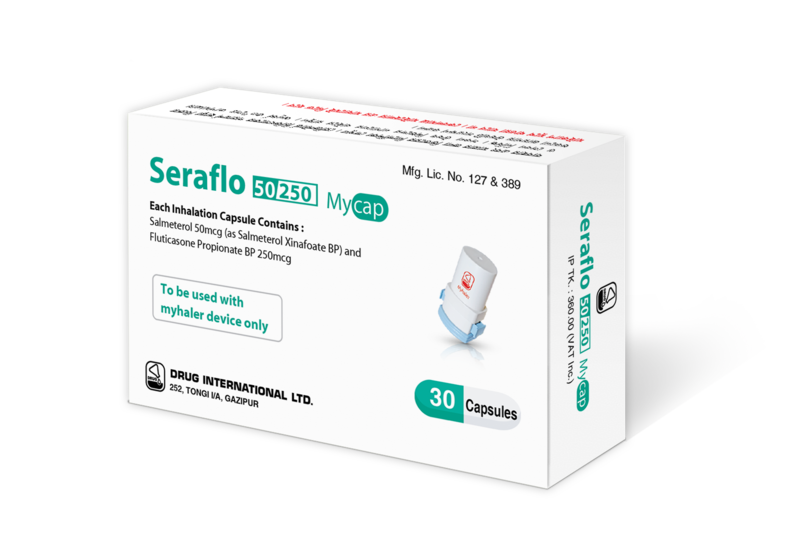 The recommended starting dosages for Seraflo 50/100 Mycap & Seraflo 50/250 Mycap for patients aged 12 years and older are based upon patients' asthma severity. For patients with asthma who are not controlled on an inhaled corticosteroid, the dosage is Seraflo50/100 Mycap : 1 Mycap capsule, twice daily (morning and evening, approximately 12 hours apart). Chronic obstructive pulmonary disease : Seraflo 50/250 Mycap: 1 Mycap capsule, twice daily (Morning and evening, approximately 12 hours apart). Or, as directed by the registered physician. Rinsing the mouth after each inhalation is advised. potential benefit justifies the potential risk to the fetus. Caution should be exercised when the drug is administered to a nursing mothers. Packing : Seraflo 50/100 Mycap : Each box contains 3x10's capsules in Alu-Alu blister pack. Seraflo 50/250 Mycap : Each box contains 3x10's capsules in Alu-Alu blister pack.